L’Oréal Paris is one phenomenal brand available in the Indian market and has been known for delivering some of the best makeup products over the years. From base makeup to lips and eyes – L’Oréal Paris has it all. They have added several new products in their makeup line in the past 2-3 years which we absolutely love and adore. Their products are readily available in the Indian market as well as online with lucrative discounts from time to time. Choosing the 10 best makeup products from L’Oréal in India is quite a task as every product seems to be a cult favorite. Read on to know more about the Top 10 L’Oréal Paris products available in India which are totally worth buying! One of the best range of lipsticks in India which has an unbelievably comfortable matte texture and pigmentation.They come in a gorgeous metallic rose gold packaging with a color coded portion as well which eases identification. The texture is creamy-matte that glides without tugging or pulling the lips and settles in a moist matte finish, true to its name. The shades are beautiful and compliment the Indian skin tone well. It gives an opaque finish in terms of pigmentation and stays quite long on the lips. Besides the original Moist Matte Range, it is also available as L’Oreal Collection Star Red Lipsticks. The Reno Liquid Foundation comes in 11 shades with a good warm undertone and deeper shades. The rather thick but blendable consistency is easy to work with. It gives a medium to high coverage with a comfortable matte finish but still needs to be set with powder for oily skin in summers. The Infallible Powder Foundation is available in 4 shades and comes in a compact packaging. The texture of the powder is soft and silky and feels creamy to touch. It gives light to buildable coverage and doesn’t look too cakey or made up. This is one of the best base makeup range that compliments the Indian skintone and is totally worth buying. Packaged in an exquisite gold and black packaging, the mascara has been a favorite of very girl and makeup artist in India. The color is jet black and defines the lashes well enough for any look. The wand has the right balance of bristles which adds both volume and length to the lashes. It gives you the falsies effect in the utmost natural way. The L’Oreal Mascara has a medium consistency and the texture takes few seconds to dry up, giving you a smooth and smudge-free look. It also holds the curl well and the clump factor is almost minimum. Although the price is a bit higher than regular drug store mascaras, but the effect is unmatchable. One of the best L’Oreal beauty products available in India. 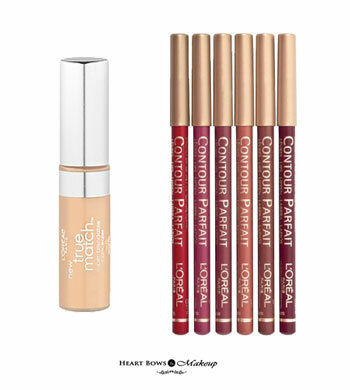 Popular as one of the best concealers in India, the L’Oreal True Match Concealer comes in a small light weight cylindrical tube with an applicator brush attached to the cap. The concealer is available in only 3 shades which might be a little con for some people. However, the texture is truly beautiful and blends like a dream. It has a creamy liquid consistency which provides medium to high coverage with brightening effect like ultra-fine reflective particles, especially when used under the eyes. It does not look cakey and gives a natural finish. The staying power is also praiseworthy. One of the top L’Oreal products in India. Filling in your lips with a lip liner not only beautifully defines the pout but also makes your lipstick last longer. One of the best lip liners in India are the L’Oréal Lip Liners which are available in various shades of brown, pinks and red. This is a sharpenable liner which is excellent to draw the arches of the lips. The texture is creamy-matte and settles down to a dry-matte finish. It has a long staying power of around 5-6 hours. 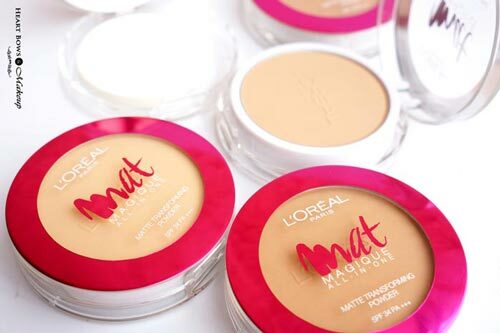 The pigmentation is top notch and is one of the best L’Oreal products worth buying. This is a much raved about budget friendly compact which was also featured in our list Best Compact Powders Available in India. The two things that makes it an ultimate favorite is firstly, the price factor since it is easy on the pocket. Secondly, the shade range. It comes in 5 shades with warm undertones ranging from fair to dusky. It is a great option for oily skin and has oil absorbing particles that keeps the skin fresh and oil free for a good duration of time. The texture is soft and silky and doesn’t cling onto dry patches. The powder also has SPF 34 and PA+++ making it perfect for day time wear. Definitely one of the best L’Oreal Paris makeup products in India. 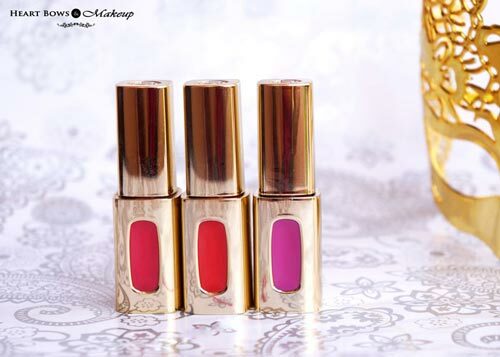 The Extraordinaire Lip Colors comes in a dazzling gold tube with an applicator. The texture is slightly thick, however, there is no stickiness at all. It adds a gorgeous layer of shine and glossiness on the lips with a good color pay off. This is the ideal lip color for those who have dry lips and are not a fan of matte lip colors. It also stays for around 3-4 hours depending on the color and doesn’t look uneven when it fades. The range is available in 2 finishes- shine & matte, with the shine range of color providing a glossy finish and the matte range settles into a semi-matte non drying finish. Easily the best L’Oreal beauty product in India which we totally adore. The new L’Oreal Kajal Magique Bold is creamier, darker and more long wearing than its predecessor, making it one of the best L’Oreal products in the Indian market. With its deep matte jet black pigmentation and creamy soft texture that glides on the eyes like a dream, it is a total winner. The kajal is completely smudge-proof and waterproof and stays on the eyes for around 6-7hours with minimal fading on the waterline. It doesn’t crumble or irritate the eyes as well. It is a bit expensive compared to other kajals, but the quality is totally worth it. The Color Riche Nail Polish from L’Oréal Paris comes in beautiful shades and finishes for every occasion. They also have few stunning top coats which add alot of glamour to the nails. The packaging is simple and light weight with a good quality brush. The nail paint brush is tapered at the tip and the flat profile on the body helps to spread and apply the lacquer on the nails evenly. Most of the nail paints require two coats for a complete opaque finish. The texture is great and provides a streak-free and glossy finish. 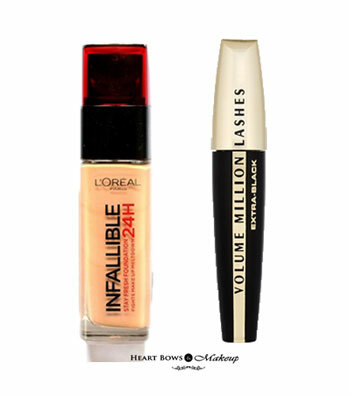 They are also long lasting and the best affordable L’Oreal makeup products in India. This L’Oreal Gel Liner was re-launched as part of their Cannes 2015 collection along with a few other products. It comes in a small glass pot with glossy golden lid and a brush for application. It is available in 5 gorgeous shades (Profound Black, Sapphire Blue, Chic Brown, Diamond Black and Royal Blue) which are great for both daily as well as party wear (especially the shimmery ones). The texture is creamy and soft and sets quickly. The pigmentation is great and so is the staying power which stays upto 10hours. 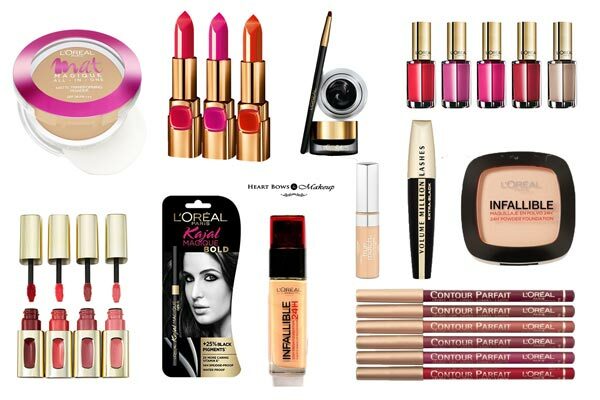 So those were our top picks as the best L’Oreal Paris Makeup & Beauty Products in India which are worth buying. 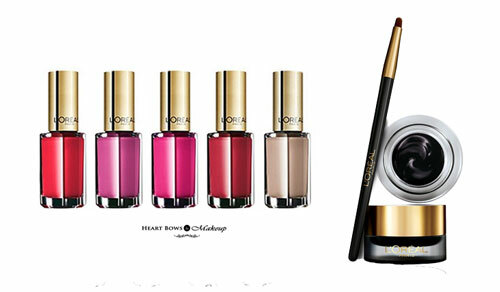 Let us know what are your must haves from L’Oreal below. Why Aishwarya Rai’s Purple Lips at Cannes 2016 is The Dopest Thing You’ll See Today!